Recovering from a last-second cliffhanger delay, NASA finally launched its second state-of-the-art rover to Mars late Monday, sending the $400 million "Opportunity" spacecraft on its way atop a hot-rod Delta 2 rocket that lighted the night sky for dozens of miles around. Running nine days late because of bad weather, insulation problems and battery trouble on the Boeing-built Delta 2, Opportunity roared away from launch complex 17B at the Cape Canaveral Air Force Station at 11:18:15 p.m. EDT, NASA's second Mars launch in less than a month. "It's been a very clean, very successful launch," said NASA Administrator Sean O'Keefe, dropping in on reporters at a press site near the launch pad. "We've now got two rovers on the way to Mars." Initial data from the spacecraft as it began its seven-month cruise to Mars showed all systems operating normally after a flawless climb to space. "All subsystems are reporting everything is in healthy shape," said deputy project manager Richard Brace. "We're in a power safe state, so we're getting power from the solar panels and charging the batteries. ... We're good." The slender Delta 2 screamed off the launching pad with an unfamiliar rush of speed thanks to a set of beefy Delta 3-class solid-fuel boosters needed to provide enough power to reach the red planet as Earth and Mars slowly change position in their orbits around the sun. 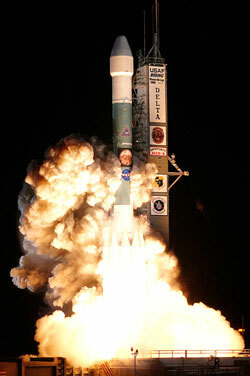 This was the first launch of a so-called Delta 2 "Heavy," but it appeared to go off without a hitch. Passing through the sound barrier 30 seconds after liftoff, the rocket arced eastward over the Atlantic Ocean and quickly disappeared from view. Eighty-three minutes after launch, the Opportunity spacecraft separated from the Delta's third stage rocket motor to begin its long cruise to Mars. 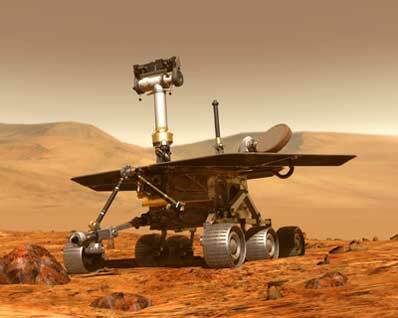 NASA's Spirit rover, launched June 10 and now millions of miles from Earth, is scheduled to reach Mars on Jan. 4. Using a parachute-airbag landing system similar to the one that successfully delivered NASA's Mars Pathfinder to the surface in 1997, Spirit is targeted for a "bounce-down" landing in Gusev Crater, a 100-mile-wide depression where scientists believe water once pooled. Opportunity is bound for the opposite side of the planet, landing in a region known as Meridiani Planum on Jan. 25. Orbital analysis shows high concentrations of hematite in the area, a mineral that usually forms in the presence of water. Opportunity's launch originally was targeted for June 28, but the flight was delayed at the last minute because of range safety issues and high-altitude winds. During turnaround operations, technicians discovered debonded insulation on the first stage of the Delta 2. The insulation was installed to keep the skin of the rocket cool during its faster-than-normal climb out of the lower atmosphere. In the end, it took a week to correct the problem. Launch was delayed an additional day, from Sunday to Monday, because of work to replace a battery in the rocket's self-destruct system. As if that wasn't enough, the countdown ticked down to within seconds of liftoff tonight when problems with a sluggish first stage fill-and-drain valve forced yet another delay. But this time around, the problem was corrected in time to make a second instantaneous launch window at 11:18 p.m.
"It's almost Murphy. Everything that could go wrong, did go wrong," joked NASA launch manager Omar Baez. But when all was said and done, "the flight did well. We're looking very good, it's been a very nice flight for the inaugural flight of the 7920 (Delta 2) heavy. It's a very important mission for the agency." NASA only had until July 15 to get Opportunity off the ground before standing down for four years while Earth and Mars returned to favorable launch positions. NASA managers no doubt breathed a sigh of relief when the Delta 2 finally roared to life this evening, 12 minutes before Mars rose on the eastern horizon. "These missions are not designed to find life on Mars," said NASA science chief Edward Weiler. "They're not designed to find water on Mars. They are designed to answer a critical question in the search for life. We know Mars had water, we know it had it in the past, it may have it in the present. What we don't know is how long this water existed in place and how long it stayed there. If it stayed there for tens of millions of years, there's a good chance that life might have evolved. Because on Earth, wherever we find water, energy and organic compounds, we find life. No matter what the conditions are." Principal investigator Steve Squyres, a Cornell University geologist, said launching two identical rovers to opposite sides of Mars will double the odds of success and provide a potentially mind-boggling scientific bonanza. "The science objectives of the MER (Mars Exploration Rover) project is fundamentally to determine whether or not Mars ever had conditions at its surface that would have been capable of supporting life," he said Friday. "It's about habitability, was the planet once a habitable place? "It's not very inviting today. It's cold, 60 degrees below zero, it's a very dry place. If you took all the water vapor in the martian atmosphere and condensed it out on the surface, you'd make a layer about a hundreth of a millimeter thick. It is a desolate, dry, barren world today. "Yet when we look at Mars from orbit, we see these tantalizing clues that it was once warmer and wetter," Squyres said. "We see dried up river valleys, we see dried up lakebeds, we see mineral deposits that are the signatures of minerals that might have been deposited in liquid water. So we've got all these tantalizing clues that it used to be different. And more than that, it appears it may have been different back three, three-and-a-half, four billion years ago, the same period of time when somehow life was coming into being from non-living material on this planet. "So it immediately begs the question, if it happened here under warm, wet conditions, and it was warm and wet there at the same time, could it have taken place there as well? So we want to really find out whether or not Mars had what it takes, whether it had the conditions necessary to support life. Now in order to do that, what you need is you need a robot field geologist. And that is what this machine is all about." Spirit and Opportunity are both equipped with high-resolution stereo cameras mounted on a five-and-a-half-foot-tall boom that will provide the equivalent of 20-20 views of the surface. "These are images that would look good projected on an IMAX screen," Squyres said. "These are going to give you a spectacular view of Mars." An infrared spectrometer housed in the body of the 384-pound rover will use the same camera boom as a periscope of sorts, helping scientists identify rocks for closer analysis. And both rovers are equipped with ingenious robot arms carrying microscopes, spectrometers and "rock abrasion tools," or RATs, to grind into selected rocks, exposing pristine interiors. Both golf cart-size rovers are expected to travel up to a football field each day, farther than Pathfinder's minuscule Sojourner rover managed over its entire three-month lifetime. "Spirit is on its way to a place called Gusev crater," Squyres said. "Gusev crater is a big hole in the ground, it's about 100 miles in diameter and it's got a dry river bed flowing into it. There was a lake there. If you can come up with an explanation for a configuration like that with a hole in the ground and a river flowing into it and no lake, I'd like to hear about it. "The other lander, Opportunity, is going to a place called Meridiani Planum. Meridiani is a marvelous place, it is smooth, it's flat and we think it will be very suitable as a landing site. And most importantly, it has this mineral, coarse, gray hematite. Now hematite is a mineral that forms under a range of conditions on Earth but in almost all circumstances, hematite forms as the result of liquid water. So here we have a place that's like a chemical beacon, visible from space, saying water may have been here. We're going to go there and try to read the record at that site." Weiler refers to Mars as the "death planet" because so many missions have ended in failure, including two back-to-back NASA missions in 1999. "Landing on Mars is tough," he said. "We can do everything right, we can spend $400 million as we did on each one of these things and we get a gust of wind that exceeds the limits, which ruins the mission. ... These are pretty quote-unquote 'safe' places to land, but all it takes is a boulder the wrong size, in the wrong place. I mean, I hate to be a nattering nabob of negativism, but if you take a jellied piece of bread and you drop it, which side is it going to land on? So that's why I'm glad we have two rovers. With two rovers, I hope we have one jelly side up." And "if we beat the odds and the missions arrive safely, I think it's safe to bet we'll see the biggest scientific return from another planet that we've ever seen and we'll see some of the most fantastic martian landscapes you can imagine," Weiler said. "But the job is just beginning. It's not time for champagne quite yet."